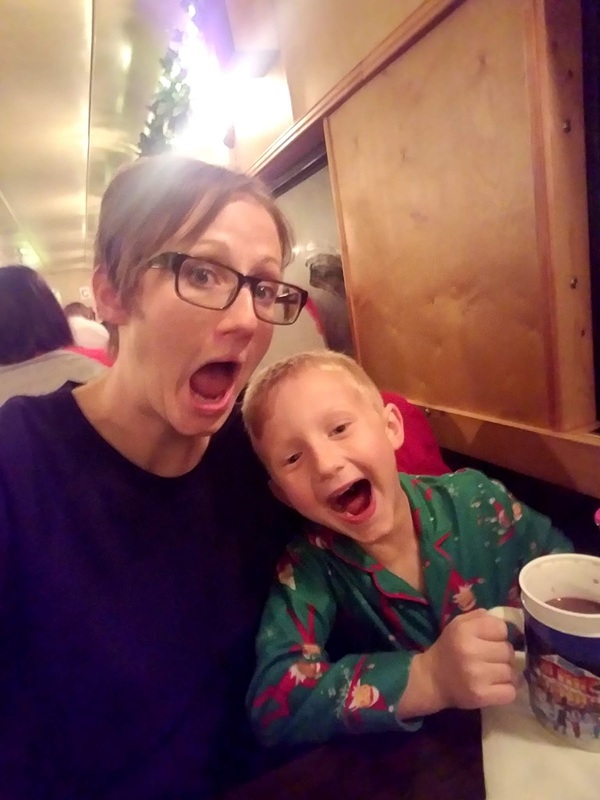 I think everyone I know has taken their kids to ride the Polar Express train. I have always been afraid to schedule it. 1. What if Colin hated It? 2. If he hates it, too bad, because you're stuck on there for over an hour and half. 3. It's an expensive thing to go to and then hate. 4. That's a long time to be trapped in close quarters with people if Colin screams and cries the whole trip. 5. Sitting is hard....and there's lots of sitting on a train. 6. I can't take Finn and leave Colin at home, I'd feel so guilty. We have learned the things that he can do, and we know the things that are too much for him. We choose our activities carefully, taking into consideration a lot of things: is there waiting? Is there sitting? Is it structured? If those answers are "yes," then we usually avoid it. But my mom really wanted to take the boys this year. Last week, we pulled out the boys train set. We rotate toys and they play with them like they're new. Colin started looking at Thomas the train books all on his own this week. We talked about the train, talked about going to the North Pole, talked about seeing Santa (he loves Santa). We got to the hotel room, and we added "santa" to his communication device. 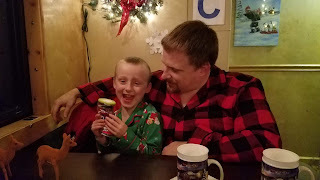 He started using it to talk about trains and Santa. He verbally said "train!" He was ready to go, practically ran to the car, and went into the train station happily. The boys needed $40 worth of toys from the gift shop. He played the games they had set up in the holding room. He was so happy and excited. They announced, "the train is coming. I see a train!" We all ran outside to watch and wait. He saw the train. He started pointing and fussing. He cried. He covered his ears...but he couldn't take his eyes off of the train. I handed him his device and said, "what do you want, Bub?" He wanted to get on that train. For him, it's a fine line between "excited" and "anxious." He called himself down so well and we continued to wait for boarding. We got on the train, and I don't think he's ever been happier. The train ride was 100 minutes, and both boys were perfect the entire trip. We sat in our seats and drank our drinks and ate our cookies. We participated in the singing and little games. Unless you're an autism parent, you won't understand this, but it felt like what I imagine "normal" parenting to feel like. We were just in the moment and had fun. We weren't running or chasing or screaming or melting down or planning five steps ahead to avoid all of the above. We weren't separating- one parent with one kid, one parent with the other - Because one couldn't handle the activity. We were together, having fun. Together. That word is important and special for us. 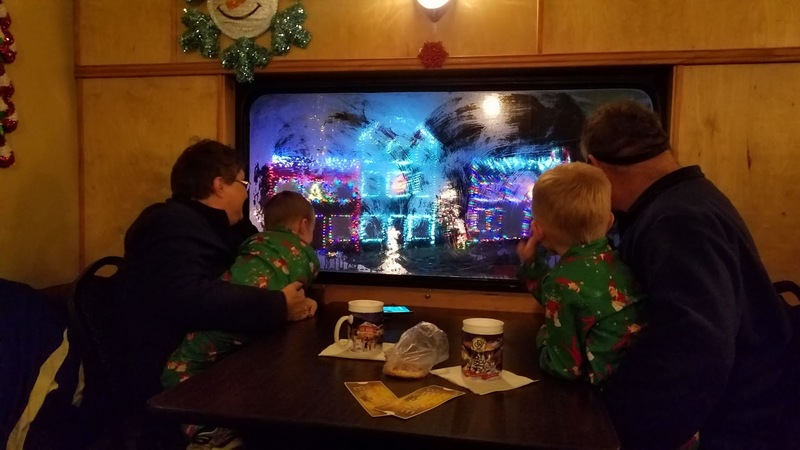 When we got the North Pole and saw the lights, Finn and Colin both jumped up and ran to Grandma and Grandpa's side of the train so they could see better. I knew Finn would do well, and I knew he would love it. Colin, I just wasn't sure, so I was thrilled when he had the best time too. I am so thankful that we are able to do things like this as a family, because I know so many kids whose sensory issues and/or anxiety would prohibit family activities like this. 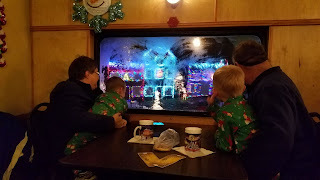 If you haven't done the Polar Express, I highly recommend it. Some things to know though: it is loud when the crew sings. There was a little area at the bathroom where you could escape to if necessary on our train. The lights were pretty dim, so that was calming. They had entertainment activities before boarding, and you could walk around outside to see the Christmas lights.